Video: DOCTOR WHO "Pond Life Part 5"
Every day this week, a new mini-adventure in anticipation of the new DOCTOR WHO Series 7 premiere on Saturday. Curtis Publishing presents this 1945 look at the Saturday Evening Post in its MAGAZINE MAGIC. This 40 minute featurette shows us the whole process of creating and publishing magazines like Country Gentleman, Jack and Jill, and other Curtis Magazines. 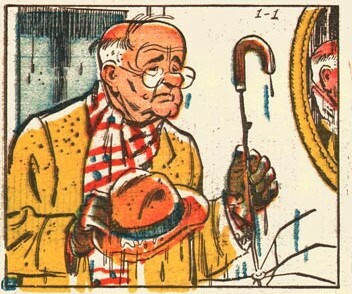 Norman Rockwell and HAZEL cartoonist Ted Key have cameos. Pulitzer Prize winning journalist Chris Hedges talks abut DAYS OF DESTRUCTION, DAYS OF REVOLT, the new book he wrote with cartoonist Joe Sacco. Mr. Hedges talks about huge pockets of impoverished cities "on the verge of cementing a permanent underclass." Piya Chattopadhyay is the host for this 25 minute program. Video: DOCTOR WHO "Pond Life Part 4"
It's apparent that the oil companies did not have any input into this! 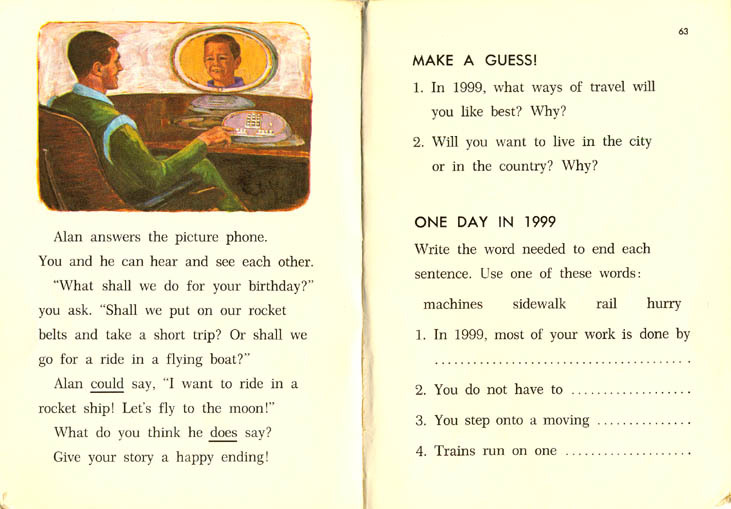 And the lawyers would have a field day with moving sidewalks, rocket belts, etc. Man oh man, I am too cynical now. I remember thinking, when I was a kid in Iowa City, that this was going to be the way it would be! Heck, it's in a BOOK. It's gotta be true if it's in BOOK. -- from my blog entry of July 12. 2006. Sometimes there are comic strips and cartoonists that never get the recognition they deserve. 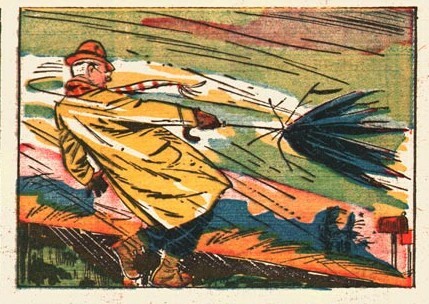 Creig Flessel, who was a comic book artist before superheroes were on the scene, was a journeyman cartoonist. 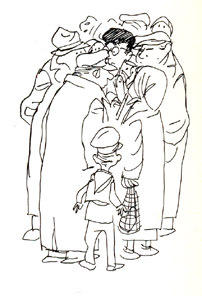 (He studied in New York City, where his classmate was Charles Addams.) While at DC Comics, he became known for characters like The Sandman and The Shining Knight. The son of a blacksmith, Creig went on to have a successful career in advertising and comic strips. He was also chair of the Berndt Toast Gang, the Long Island chapter of the National Cartoonists Society. Perhaps he is best known as a cartoonist's cartoonist; revered among his peers, but not as well known as the big names. My friend Ger Apeldoorn seeks to shine the spotlight on Creig by showing us some gorgeous DAVID CRANE Sunday comic strips from the early 1960s. I agree with Ger: there is a loose, confident, illustrative ink line at play. Well worth savoring. Video: DOCTOR WHO "Pond Life Part 3"
The last week in August. The traditional time to get away from the routine. 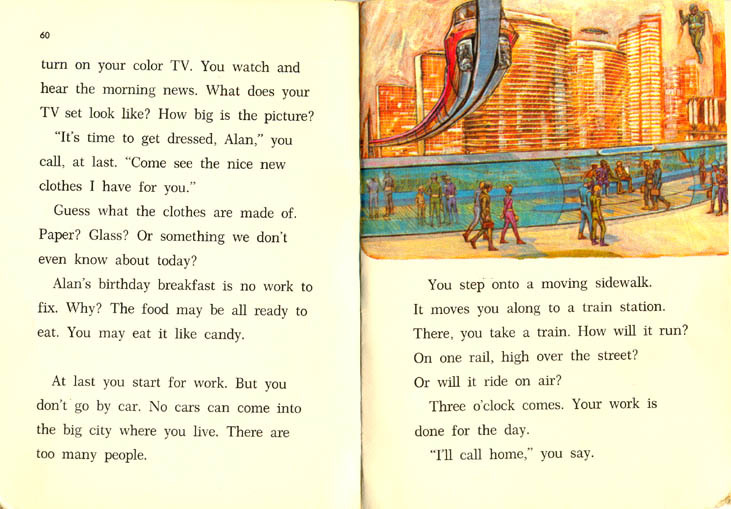 In the 1960s, Hank Ketcham took his first big trip abroad. And, Ketcham being Ketcham, he took along pad and pen. The result is a must-see. 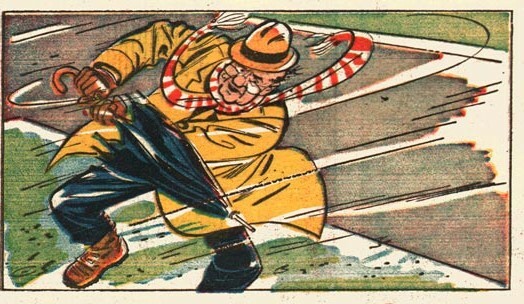 Marcus Hamilton, who currently draws the Dennis the Menace dailies told me about Hank Ketcham's book I WANNA GO HOME. It's about Ketcham's first European tour in the 1960s. I had never heard of it. I found the book online and bought it sight unseen, on Marcus' suggestion. Boy, Marcus was right! 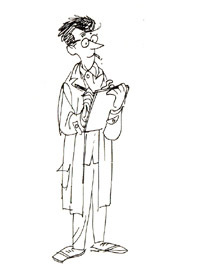 The book is fun, sure -- but the sketches! WOW! I could not get over the sketches. So alive, so loose. All those lines -- all those 50 year old lines -- still vibrant and full of the excitement that Ketcham had for the excursion. "This is the story of my maiden voyage, the first time I ever ventured beyond friendly U.S. shores. I was pretty 'gee whiz' about everything and my head was on a perpetual swivel." 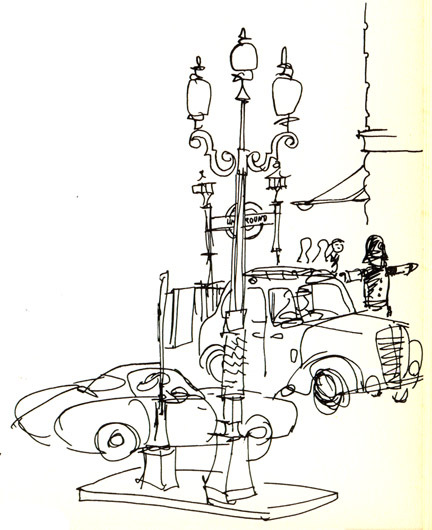 I like looking at the controlled messiness and immediacy of a quick sketch. You can see that Ketcham was a master. I would love to see a graphic novel with these people in it. Very characterful. Look at that assured, quick linework. 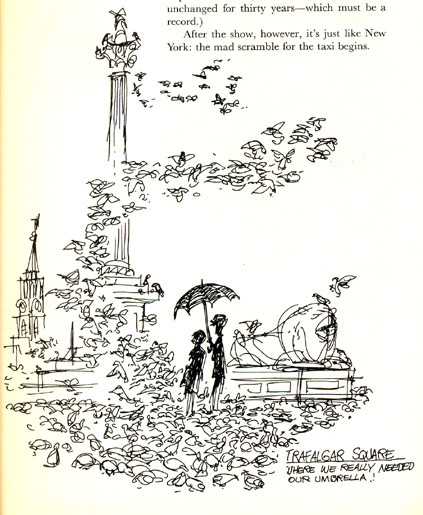 And here is Trafalgar Square, with squiggles of pigeons cascading in the London sky. How Ketcham is able to make amorphous loopy blobs appear to be flying birds, I don't know. It's some kind of magic from a master, isn't it? Wonderful to see this. Thanks again, Marcus! From a blog entry originally published August 17, 2006. Video: DOCTOR WHO "Pond Life Part 2"
Every day this week, a new mini-adventure in anticipation of the new DOCTOR WHO Series 7 premiere on Saturday. Part 1 is here. Video: DOCTOR WHO "Pond Life Part 1"
http://www.bbc.co.uk/doctorwho Pond Life is the new 5 part mini-adventure, with a new part every day, featuring the Doctor, Amy, Rory and some surprise familiar faces! En route to visit the Ponds the TARDIS' Helmic Regulator malfunctions, leaving the Doctor popping up everywhere in time and space. Will he ever make it back to them? 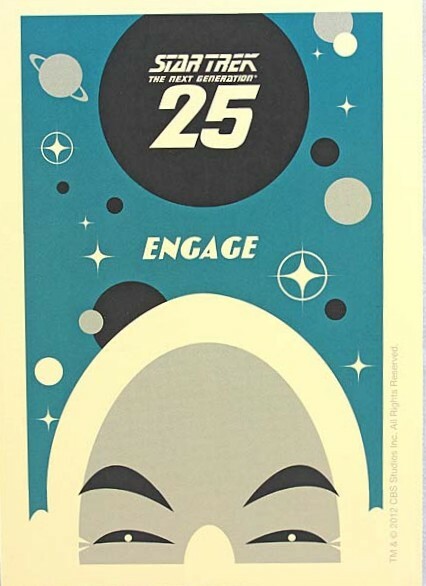 Above: art for the 25th anniversary of STAR TREK THE NEXT GENERATION. Copyright 2012 CBS. Here are some comic and cartoon advertisements that I have collected either because they are visually interesting, bring back memories or are just odd. Some cool Justice Society bookends circa 2001! 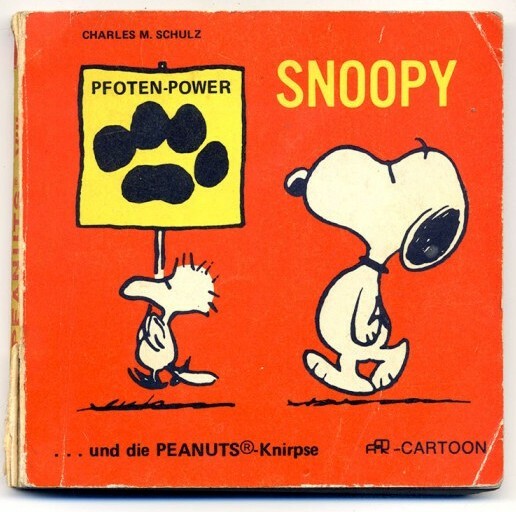 My friend Ralf Zeigermann shows us a German PEANUTS book from 1971. 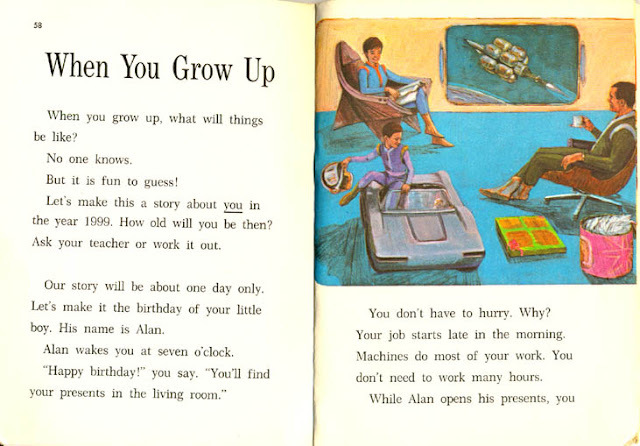 This is a the kind of book he grew up reading in Europe. Smaller and more square-sized than American volumes, with a wonderful cover. Here's a 1934 daily sequence from E.C. Segar's THIMBLE THATER, wherein the Popeye has decided to run a newspaper. Chaos, as only Segar can do it, obviously follows. 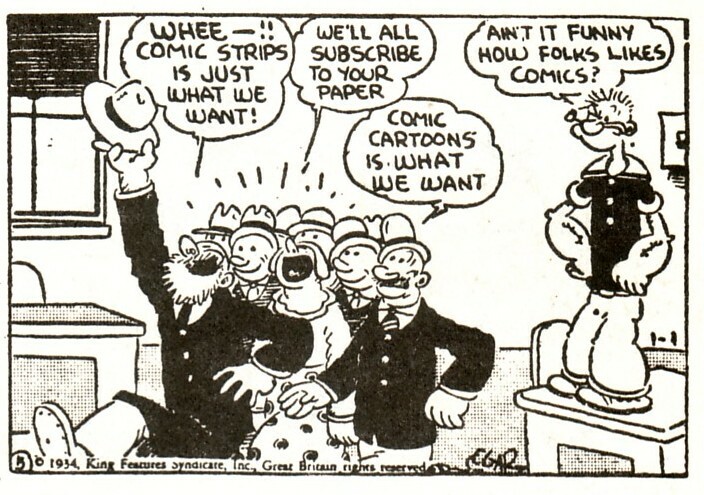 This was, at least, the second time Segar poked fun at newspaper cartoonists. The first such story appeared in 1928, a year before Popeye appeared in the strip. The sequence was pulled from Rick Marshall's NEMO #3, October 1983.